Which is Better After a Workout: A Hot Tub Soak or an Ice Bath? Choose Heat after a work out say scientists. A new study shows benefits of after-exercise hot tubbing, not ice bathing. 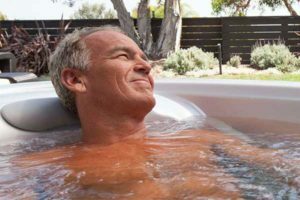 The study published in the Scandinavian Journal of Medicine & Science in Sports in December says that an after-exercise hot tub soak can improve endurance performance, especially in hot weather – a benefit not achieve by the typical ice bath after exercise. The article, “Post-exercise hot water immersion induces heat acclimation and improves endurance exercise performance in the heat,” by M.J. Zurawlew, N.P. Walsh, M. B. Fortes, and C. Potter, says that hot water immersion can help the person’s body acclimate to heat in as little as six days. In the study, 17 men ran on treadmills for 40 minutes, then some took 104-degree immersions for 40 minutes while others soaked in water at about 93 degrees. Before and after the six days of soaking, they exercised and ran 5-kilometer treadmill time trials in temperate and hot conditions. For the ones who soaked in hot water, their bodies adapted in ways similar to exercising in hot weather – the core temperature drops, the sweat rate increases, and the volume of blood plasma expands, all enhancing performance. Their performance on the time trials increased 5 percent. The finding is especially useful for athletes who train in conditions cooler than those where they must perform. Although participants soaked for 40 minutes, Walsh, who expects to conduct further researcher, said that the benefits could begin with as little as 20 minutes.